"The photographer @acullenphoto captured this #aerial view of an oil derricks from a plane flying over the the Bakken oil patch in North Dakota. 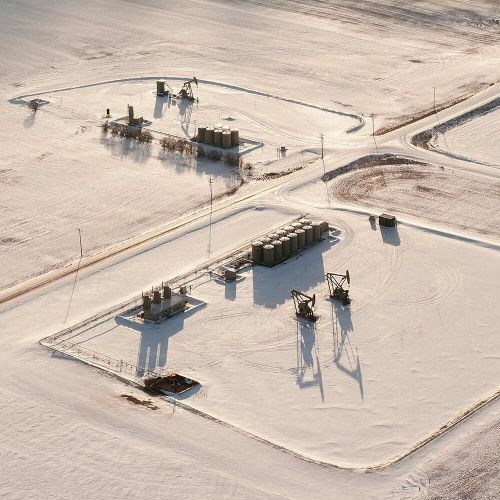 About 8 years ago, drilling began to transform the remote corners of North Dakota's plains into an economic beacon. But as oil prices have skidded to $30 a barrel, new drilling has dried up, and the flood of wealth and workers is ebbing. It's not a bust — unemployment is still low, at just 2.7% across North Dakota — but the slowdown opens an uncertain new chapter for a state that has spent heavily on new roads, schools, hotels and developments over the past 5 years. Visit the link in our profile to see more photos by @acullenphoto." By nytimes on Instagram.